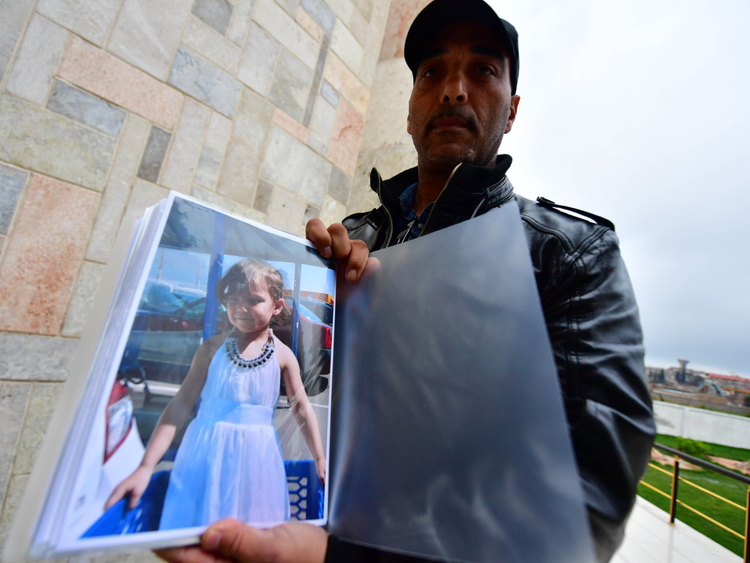 Qamishli, Syria - Four and a half years ago, French toddler Jana set off on a family holiday to Morocco - but her extremist father instead spirited her to Syria, where he joined Daesh. Now devoted uncle Mustafa Tarbouni is on the ground and desperately trying to secure the seven-year-old’s release from a cramped displaced camp in the war-torn country’s northeast, where he believes the little girl is stuck with thousands of extremist wives and their children. “The call that I make here - 100km from the camp - is that the French government finally intervenes and brings Jana” back home, the 49-year-old said, on the steps of a government office in Syria’s semi-autonomous Kurdish region. Jana has more than doubled in age since she was ripped away from her family aged just three, but Tarbouni is hoping a birthmark at the top of her thigh will help confirm her identity. Thumbing through a voluminous file, he displays endless pictures of the smiling little girl - one clearly displaying the birthmark. “I have all the necessary documents - the identity card, the passport receipt, birth certificate, all the photos - to prove the identity of this child,” he told AFP. Jana was last seen in eastern Syria in January, he said, but he can’t disclose how he knows. She was seen “in the streets of Shaafa”, one of a string of utterly destroyed settlements that meanders to Baghouz, a village on the Euphrates River where US-backed forces last week dealt a death blow to the Daesh “caliphate”. The Kurdish-led Syrian Democratic Forces announced the end of the group’s territorial control on Saturday, after a grinding ground campaign supported by US-led coalition air strikes. In August 2014, Jana’s father Eddy Lerroux picked up Jana from his ex-wife’s home in central France, allegedly to take her to Morocco on holiday. But instead the extremist and his partner Jihane Makhzoumi took Jana, and three other children - including a six-week-old baby - to the “caliphate”, which then sprawled across a vast swathe of oil-rich territory in Iraq and Syria equivalent to the size of the United Kingdom. A Muslim convert who adopted the name Zayed, Lerroux died “in fighting” in 2015 in Palmyra, an area in the central Syrian desert then controlled by Daesh, according to Tarbouni. Makhzoumi was arrested at Roissy airport in Paris on her return to France in October 2016. She brought back “her own three children, but decided to sacrifice my niece by leaving her behind”, Tarbouni said. Today, Jana is with a Libyan woman affiliated to Daesh who provided “Arabic courses to women and children inside this terrorist organisation”, he said. He says he has drawn his information from the work of journalists covering the extremist group and the testimonies of Daesh wives who have returned from Syria. Syria’s Al Hol camp is home to around 6,500 foreign children, among thousands more detained relatives of alleged extremists whose fate is providing a major headache for the Kurdish authorities. They have repeatedly called on their home countries to take them back, but these nations have mostly been reluctant. At least 80 French children were still stuck in Syria as of mid-February, French sources estimated. Tarbouni, who works as a child protection specialist, says he has devoted years to the quest to find Jana, including by lobbying multiple French government ministries. Jana’s family also contacted the International Committee of the Red Cross, a non-governmental organisation working to reunite families with children dragged into the caliphate’s orbit, he says, but without success. But Paris repatriated “five orphans and (other) isolated” minors in mid-March, spurring him back into action. He claims the Kurdish authorities are waiting only for a “green light” from France’s foreign ministry to allow him to enter Al-Hol camp. So on Monday, he says, his lawyer filed a request with that ministry. “It’s been almost five years without any progress,” said the uncle on the mother’s side. A Kurdish official in change of foreign affairs declined to comment on the case. Several international agencies, including the UN’s agency for children Unicef, have called for foreign children to be brought home “as soon as possible”. Two lawyers have lodged cases at the United Nations, calling on Paris to bring all children born to extremists home. France says it has not excluded bringing more orphans home, but will examine each file case by case. Tarbouni says Jana “is the symbol of many children who are suffering in the camps” of northeast Syria. “It is truly time we solved this problem,” he said.